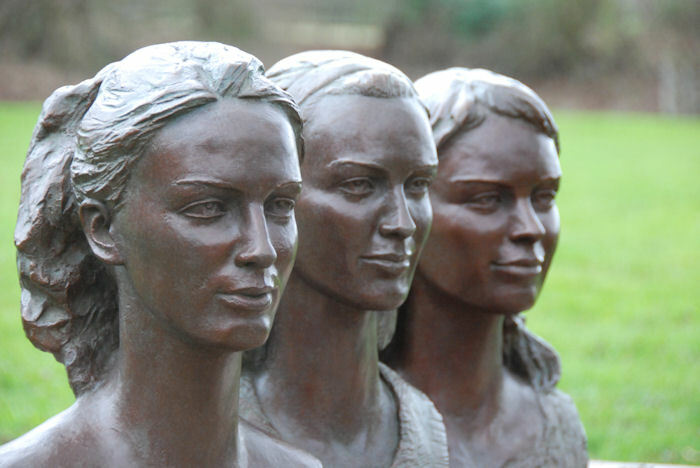 Below are the three bronze busts of Lady Violet, Lady Alice and Lady Eliza Manners - daughters (and eldest children) of the Duke and Duchess of Rutland at Belvoir Castle. They were delightful to work with. I photographed and measured the girls with callipers in their home - and then kept sending photos of the clay busts in progress by e-mail for their comments (reworking as required until they and their mother were happy with their likenesses). The girls were all very busy with school work to do much posing. Thank you so much for doing our busts. I still can't get my head around the fact that I have a head double, very strange. But I just would like to say thank you so much for doing them, I have a photo of them on my phone and my friends have commented on how alike they are to all of us!